(fōr'seps), The singular form of this word is forceps, not forcep. 1. An instrument to grasp a structure, for compression or traction. Compare: clamp. 2. Bands of white fibers in the brain, major forceps, and minor forceps. 1. a two-bladed instrument with a handle for compressing or grasping tissues in surgical operations, and for handling sterile dressings, etc. 2. any forcipate organ or part. alligator forceps strong toothed forceps having a double clamp. artery forceps one for grasping and compressing an artery. axis-traction forceps specially jointed obstetrical forceps so made that traction can be applied in the line of the pelvic axis. Chamberlen forceps the original form of obstetrical forceps. clamp forceps a forceps-like clamp with an automatic lock, for compressing arteries, etc. dental forceps one for the extraction of teeth. dressing forceps one with scissor-like handles for grasping lint, drainage tubes, etc., used in dressing wounds. fixation forceps one for holding a part steady during operation. Kocher forceps a strong forceps for holding tissues during operation or for compressing bleeding tissue. Levret's forceps an obstetrical forceps curved to correspond with the curve of the parturient canal. Löwenberg's forceps one for removing adenoid growth. forceps ma´jor the terminal fibers of the corpus callosum that pass from the splenium into the occipital lobes. forceps mi´nor the terminal fibers of the corpus callosum that pass from the genu to the frontal lobes. mouse-tooth forceps one with one or more fine teeth at the tip of each blade. obstetrical forceps one for extracting the fetal head from the maternal passages. Péan forceps a clamp for hemostasis. rongeur forceps one for use in cutting bone. sequestrum forceps one with small but strong serrated jaws for removing pieces of bone forming a sequestrum. speculum forceps a long, slender forceps for use through a speculum. tenaculum forceps one having a sharp hook at the end of each jaw. torsion forceps one for making torsion on an artery to arrest hemorrhage. volsella forceps , vulsellum forceps one with teeth for grasping and applying traction. Willett forceps a vulsellum for applying scalp traction to control hemorrhage in placenta previa. a pair of any of a large variety and number of surgical instruments, all of which have two handles or sides, each attached to a dull blade. The handles may be joined at one end, such as a pair of tweezers, or the two sides may be separate to be drawn together in use, such as obstetric forceps. 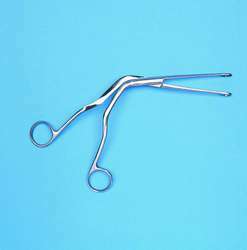 Forceps are used to grasp, handle, compress, pull, or join tissue, equipment, or supplies. See also thumb forceps, specific forceps. Ob/Gyn A 2-part surgical instrument that articulates–hinges at the center—which is placed around the neonatal head to extract an infant in an operative vaginal delivery Complications Subdural or cerebral hemorrhage, facial nerve injury, brachial plexus injury, mechanical ventilation. See BiCOAG bipolar forceps, Biopsy forceps, Bissinger detachable bipolar coagulation forceps, Cold cup forceps, Mosquito forceps, Mousetooth forceps. Cf Vacuum extraction. 1. An instrument for seizing a structure and making compression or traction. 2. [TA] Bands of white fibers in the brain, major forceps and minor forceps. Surgical instruments made in a wide variety of sizes and designs for different purposes, but all having opposing blades or surfaces, that are smooth, serrated or toothed, and that can be pressed together. Forceps are used to grasp or compress tissue, to extract objects, or to hold needles, swabs, LIGATURES or other medical items. An instrument to grasp a structure, for compression or traction. n 1. a colloquial term for an instrument used for grasping or applying force to teeth, tissues, or other objects, such as when they are extracted. 2. an instrument used for grasping and holding tissues or specific structures. n the force used for grasping or cutting bone. n a thumb forceps with a flattened plate at the end of one arm and a matching ring on the other. Originally used for isolation of eyelid tumors. It is useful for isolation of lip and cheek lesions, such as a mucocele, to facilitate removal. n forceps used for grasping teeth. n an instrument for grasping blood vessels to control hemorrhage. n.pr a tongs-shaped tool used to remove objects from the oral cavity. n a small hemostatic forceps. n a device used in filling root canals that securely holds the filling cones during their placement. n forceps whose beaks are designed to engage holes in the rubber dam retainer to facilitate its placement, adjustment, or removal. n the forceps used for grasping soft tissue; used especially during suturing. n a thumb forceps; an instrument with one or more fine teeth at the tip of each blade for controlling tissues during surgery, especially during suturing.